In 1843 the Primitive Methodist Conference established a General Missionary Committee to oversee the work of both home and overseas missionaries. Regulations concerning missionaries were agreed the following year but in the first instance any initiative lay with the circuits rather than the Connexion. It was not until January 1870 that missionaries were sent abroad by the Primitive Methodist Missionary Society, when the Revs. R. W. Burnett and Henry Roe, together with their wives, set sail for the island of Fernando Po. 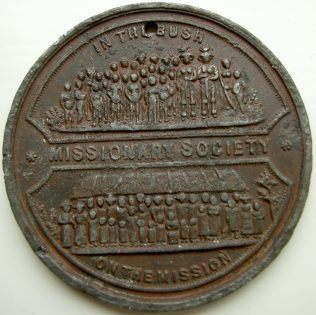 The Jubilee of the commencement of this work was celebrated by the Primitive Methodist Church in 1920, this medallion reflecting the Jubilee of the earlier formation of the General Missionary Committee. 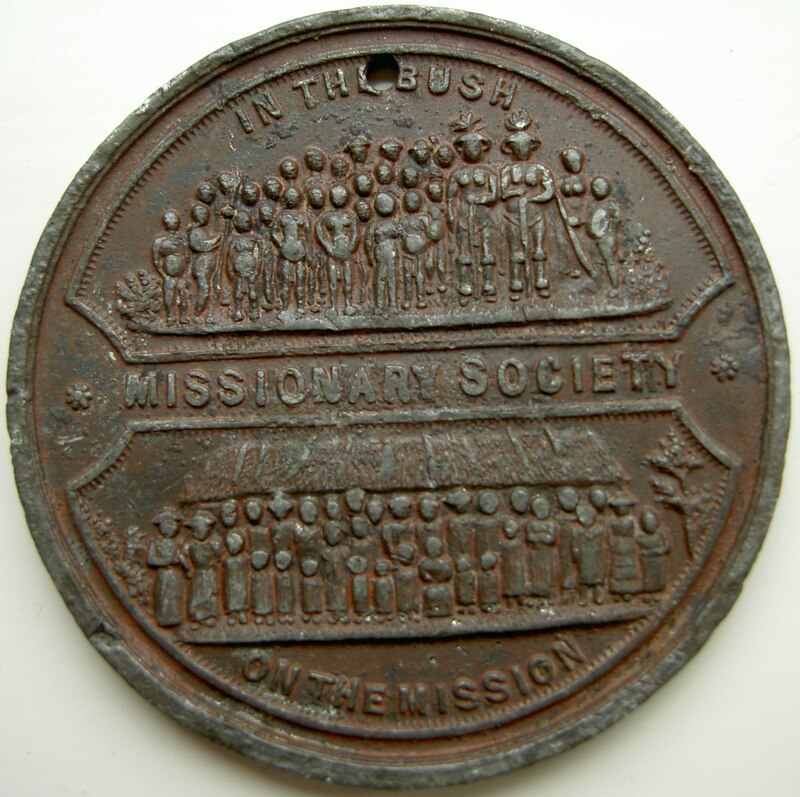 In 1892 a Missionary Jubilee effort was launched, the eventual outcome of which was the raising of just over £50,000. 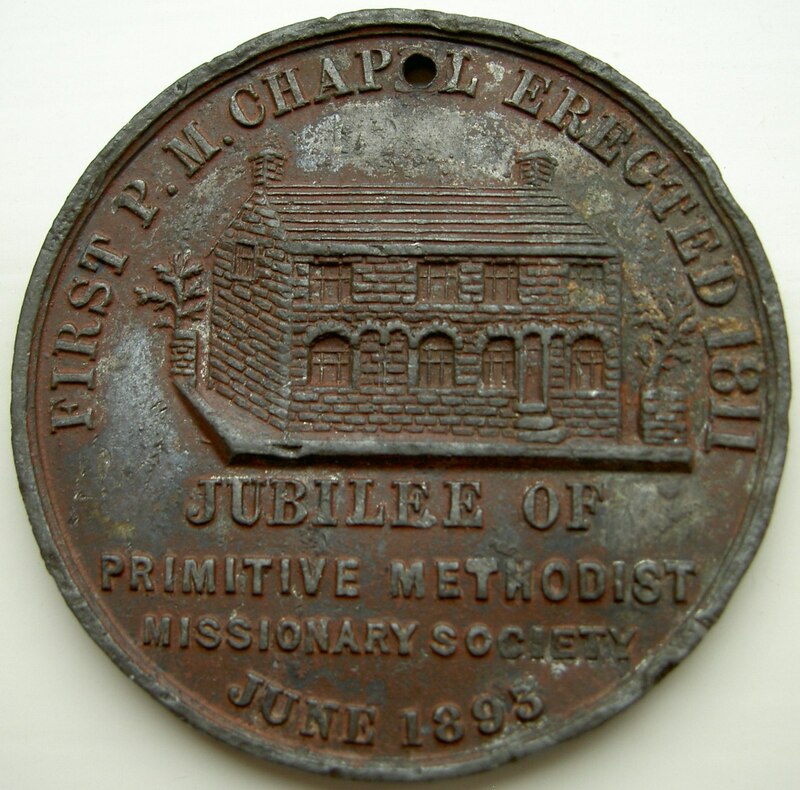 The first Primitive Methodist chapel illustrated on the medallion was opened at Tunstall on 13 July 1811 it being built in such a way that it could easily be turned into four small dwelling houses. 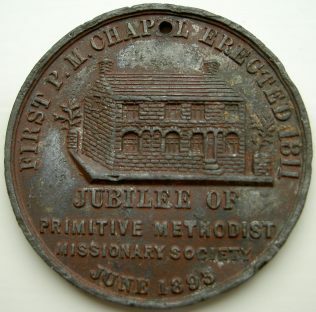 In 1821 it was replaced by a new chapel, subsequently extended, and rebuilt as Jubilee Chapel for the Primitive Methodist Jubilee Conference held in Tunstall in 1860, whereupon it became regarded as the mother church of the Primitive Connexion.